Bark is a pretty easy sweet treat to make. If you can melt chocolate, you can make bark. And by starting with the basics (chocolate, white chocolate) you can create so many different combinations of deliciousness. 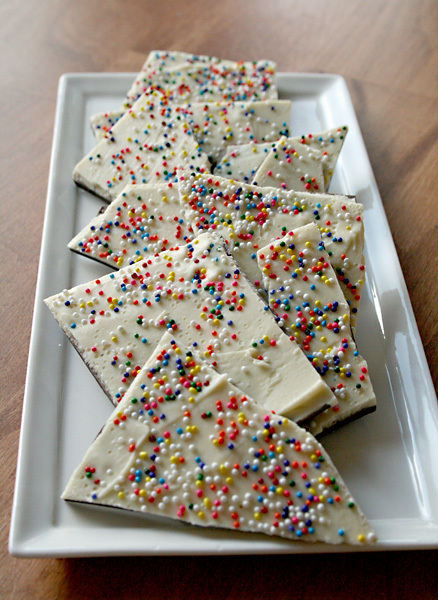 I made toffee pretzel bark a while ago that was pretty darn good. And I just made this bark, cake batter bark, that was pretty darn good too!! 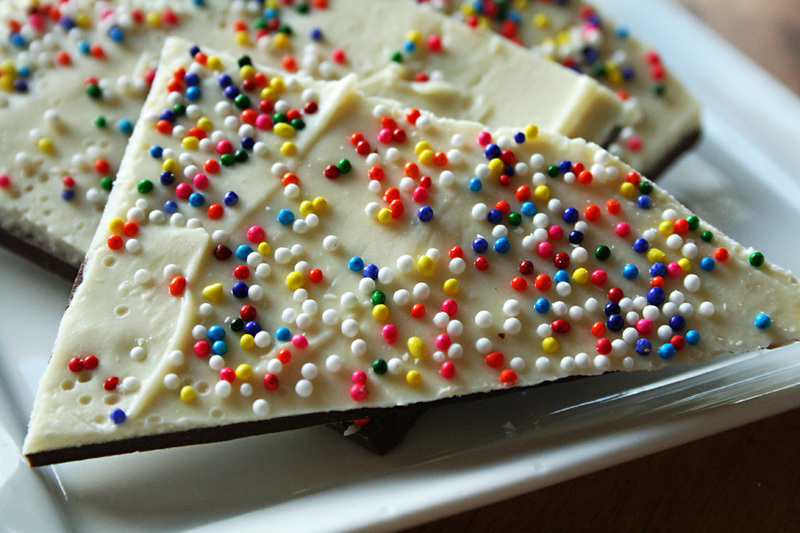 There is actual cake batter in the white chocolate part of the bark. It's only a few tablespoons but it's enough to catch that cake batter taste. 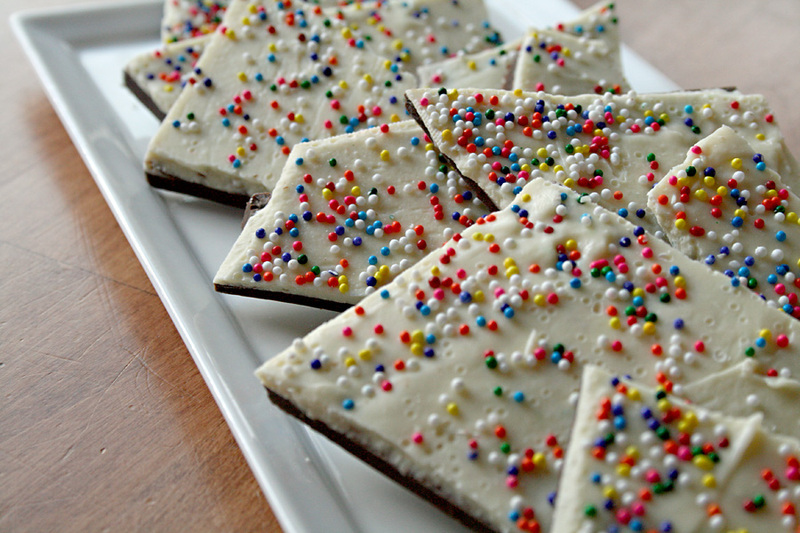 This is a fun twist on the traditional chocolate bark recipe. And I think the sprinkles add so much to the presentation. It reminds me of birthdays and cake and fun and rainbows and unicorns and all that is right in the world! So don't skimp when adding the sprinkles. Here is the recipe. I saw the original recipe on the How Sweet It Is blog and I modified it a bit for my tastes. 2. Using the microwave, melt the semi-sweet chocolate chips in a microwave safe bowl. Melt for 60 seconds, then stir. If more melting is needed, melt at 30 second increments until chocolate is smooth. 3. Spread the melted chocolate on the parchment paper. The chocolate will not cover the entire cookie sheet. Spread evenly. 4. Place cookie sheet in fridge for 15 minutes or until chocolate hardens. 5. Melt the white chocolate chips in the microwave using the technique above. 6. Add 3 tbsp cake mix to melted white chocolate. Mix until all lumps are gone. Let this stand for 5 minutes. 7. Spread white chocolate on top of semi-sweet chocolate on the cookie sheet. Spread out until the edges of the two chocolates meet. 8. Generously sprinkle the sprinkles all over the top. If needed, press the sprinkles down a bit into the chocolate before it cools so they stick. 9. 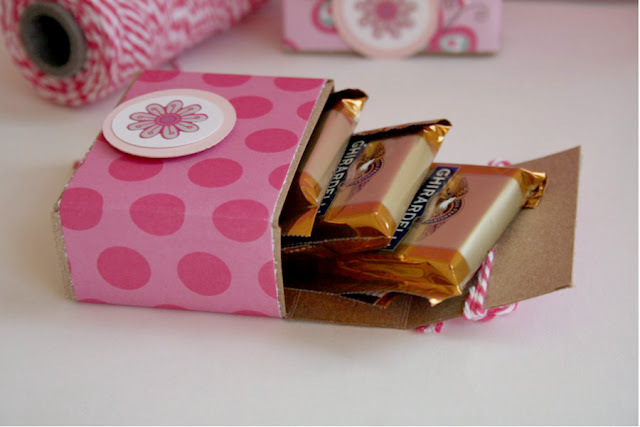 Refrigerate until chocolate sets. 10. Break into chunks. Store in airtight container in the refrigerator. I am back with another CAS-ual Friday challenge! This one is a sketch challenge and I couldn't wait to dive in. I used the Kaleidoskope Pyramid paper pad from My Momenta, a Papertrey Ink sentiment and a random button and my beloved baker's twine. I cut the doily with my Cricut. I purchased a bunch of svg doily files and I love using them! That's all I have today. Hope you are having a great Saturday!! Do you have a 2012 calendar yet? Yes, I realize it's almost February. But it seems like come the 1st of the year, I am always scrambling for a new calendar. I discovered a free calendar download on the Very Merry Vintage Style blog and immediately saw potential. When I received my first Momenta products in the mail, I started making this 2012 desk calendar. This started out as a $1 wood frame I bought at my local craft store. I used the Free To Be Me super paper pad and started altering it. I mod podged the base of the frame with paper and then fussy cut some flowers to add. 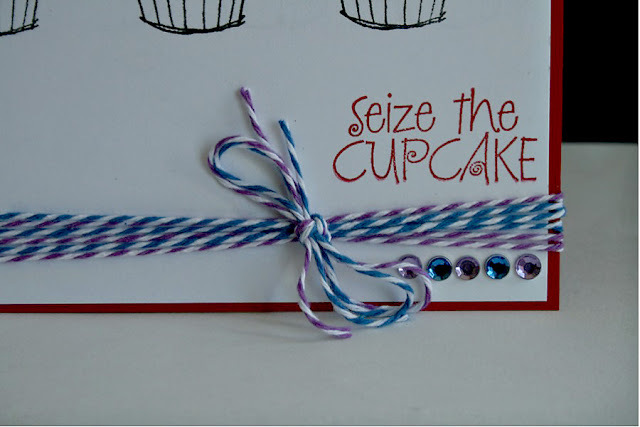 My life is not complete until I use baker's twine on my projects, so I added this banner with twine in the corner. And some glittery letters!! So I don't forget what year it is. After printing the calendar on white cardstock and cutting it out, I alligator clipped all the months together and attached to the middle of the frame. When I am finally able to get back to work, I plan on having this bright fun calendar on my desk at work. It might make the transition back to work a little bit easier. This project was my first on the My Momenta blog. Don't forget to check their blog everyday, there are new posts by all the designers on a daily basis. Lots and lots of inspiration to be found over there!! And did you know you can design your own alphabet stickers at My Momenta? Check out the video HERE and you can email Momenta for a FREE pack of stickers to try it out yourself! Pretty cool stuff. 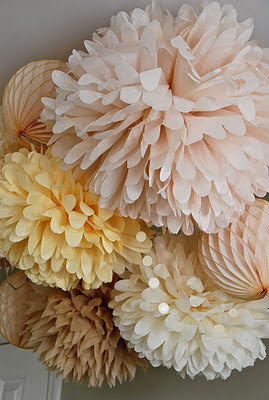 I made some of these pom pom decorations for a daughter's 7th birthday party and think they are so fun!! They also immediately made me think of a Bo Bunny stamp set I have collecting dust. So I pulled out that stamp set and some acrylic paint. I've also been seeing all sorts of wonderful mixed media art pieces in blogland lately and it made me want to get out my acrylic paints. I used the paints with my stamp and came up with this card. It's a little bit messy because of my stellar acrylic paint technique but I like it. I chose to pair the kraft and white with purple and blue, my two favorite colors. And maybe secretly because I have purple baker's twine I wanted to use. Or perhaps my love for baker's twine really is no secret? 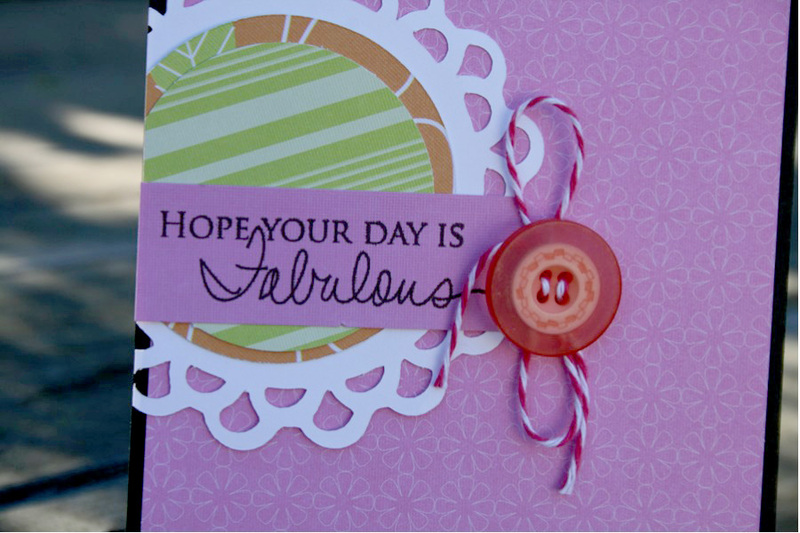 The sentiment and little swirly-do stamp is from Papertrey Ink. I didn't quite know how it was going to stamp over the acrylic paint, but it did just fine! I loved this trigger photo and hopefully will be playing along with more Moxie Fab challenges in the future. Thanks for stopping by today, Friends! I made this for my kids as a special breakfast treat. 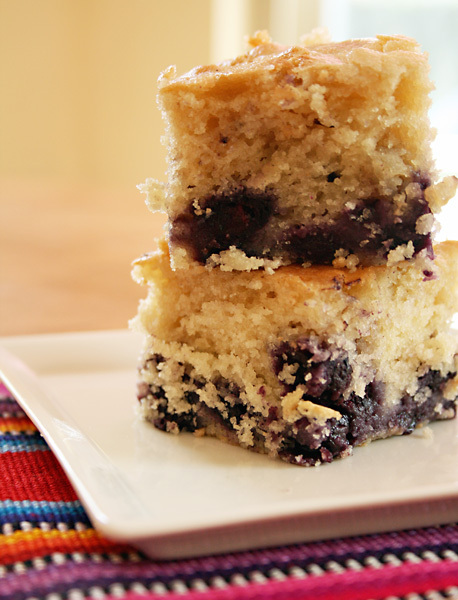 It does taste amazingly like cake and won't become an everyday indulgence. But it was delicious and appreciated by my kiddos! I ended up using frozen blueberries because my kids ate the fresh ones so fast I couldn't get my hands on them. And I didn't have buttermilk. So I made my own. You add 1 tbsp vinegar to a 1 cup measuring cup. Then add milk to reach 1 cup. Let it sit for about 10 minutes and use that as a substitute for the buttermilk. My kids have already requested this again for breakfast so I think it was a hit. 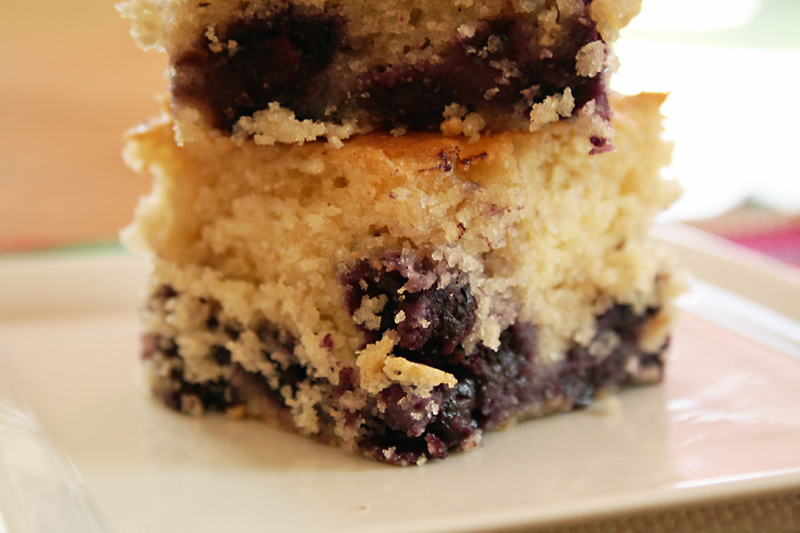 Here is where I found the recipe: Buttermilk Blueberry Breakfast Cake. Expect to see more baked goods in the future! I think my baking days are baaaack!!! I am really on a challenge kick lately. It's been really fun finding these new-to-me challenge blogs and playing along. Today it's the Runway Inspired Challenge #4. And it's all about rainbows. I love cupcakes!!! Although from the looks of it, that model above does NOT love cupcakes as much as I do. 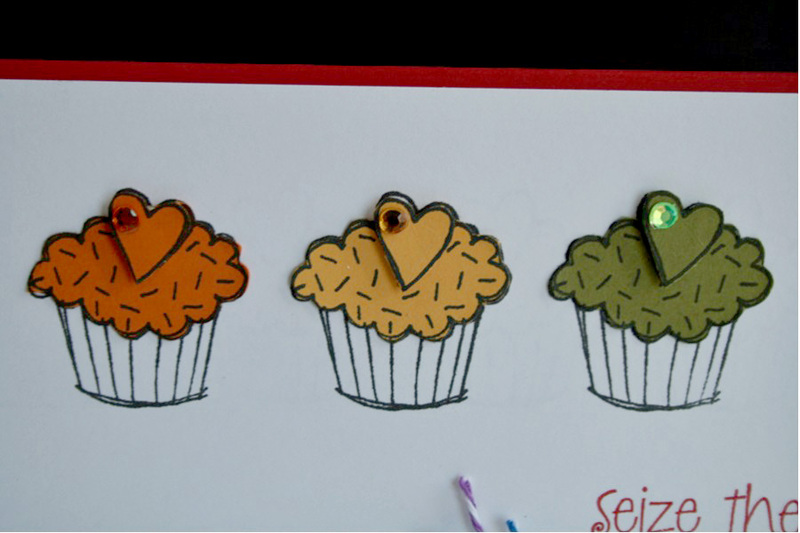 I also love my Hero Arts cupcake stamp set. So glad I dug it out of my stamp drawer this last week. I have also been doing some simple paper piecing. It works out great for me since I don't have any copic markers to color images with. And yes, big shocker...I used baker's twine! What a fun challenge!! 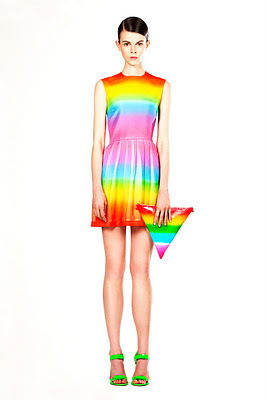 I also spent a whole bunch of time on Pinterest looking at rainbow inspired things. Now i'm tempted to make a 10 layer rainbow cake, string together some rainbow earrings and paint a huge rainbow on my daughters bedroom walls. I think i'm going to busy for the next couple of weeks. Happy Friday! 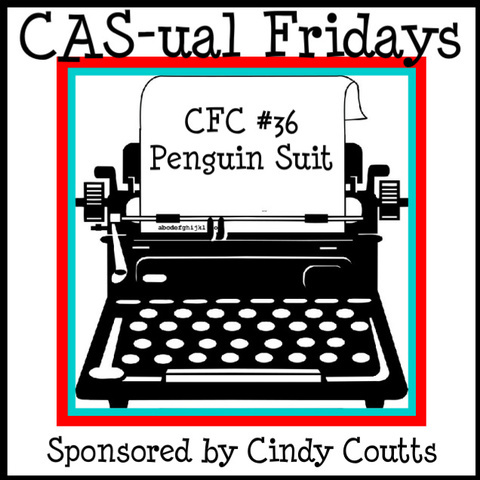 Today I decided to play along with CAS-ual Friday's challenge. And it was a fun one! 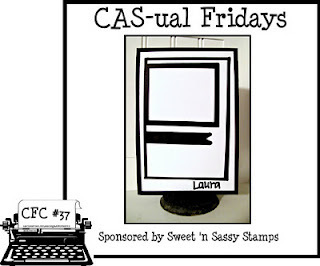 Both stamps are from Papertrey Ink. I love that oval background stamp. And somebody needs to tell me to STEP AWAY from the baker's twine. I just got a bunch of new colors from The Twinery and that's all I use right now!!! And a black button and some black pearls to round out the card. Hope you have something awesome planned for this weekend. It's supposed to rain tomorrow, my son has basketball pictures, my good girlfriend is having a 40th birthday party Saturday night and the NINERS play football on Sunday! It's going to be a good weekend! Since I am still sitting here, nursing my ankle, trying to wean myself off crutches I decided to check out some bloggy challenges to pass the time. I loved this color combo and decided to give it a whirl. I had to rummage around my scrap paper box for both yellow and pink. Yellow is not a color I use that often. The striped paper is Echo Park and the other paper is Crate Paper. 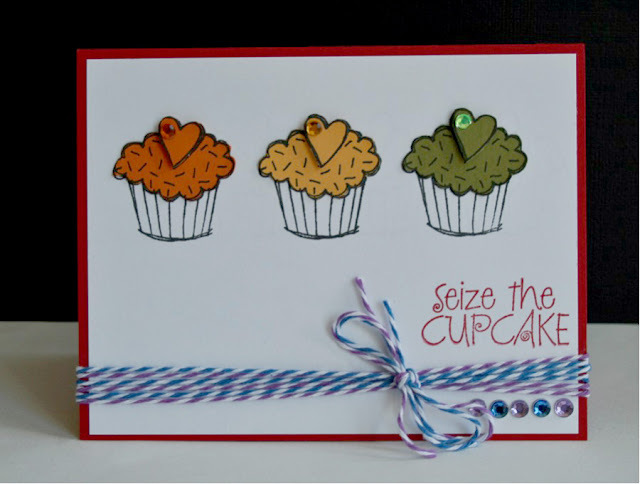 I have been enjoying this Hero Arts cupcake stamp set I stumbled upon in my stamp drawer recently. The sentiment is Papertrey Ink. I love it because it's so versatile and could be used for many different occasions! That's what I got today!! Do you ever do any challenges from challenge blogs? Which are your favorites? I need some new challenges to keep me busy today. 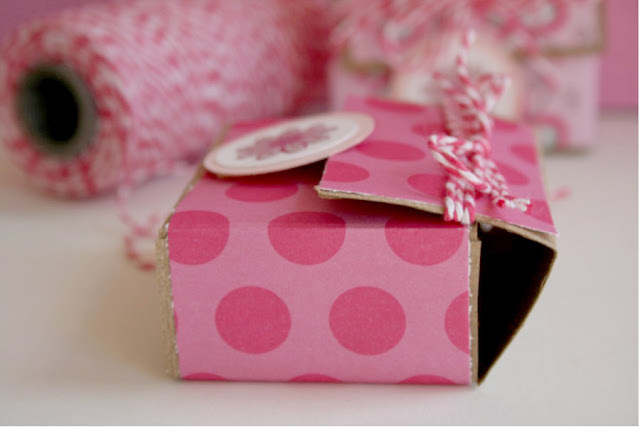 I have some fun treat boxes to share with you today. 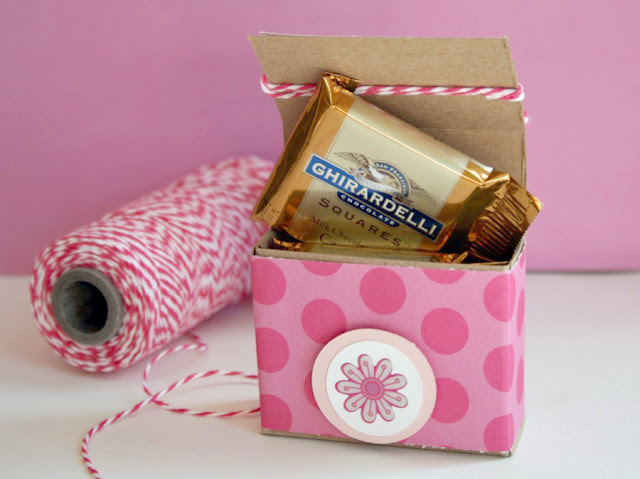 These Ghiradelli treat boxes are designed to hold 3 or 4 Ghiradelli chocolate squares and would make a fun treat for Valentine's Day! 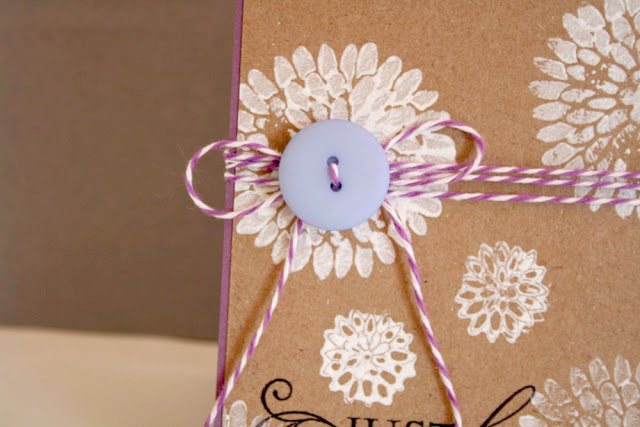 There is a great tutorial at Splitcoast Stampers and instead of reinventing the wheel, I am going to send you over there for the tutorial! Please go HERE. 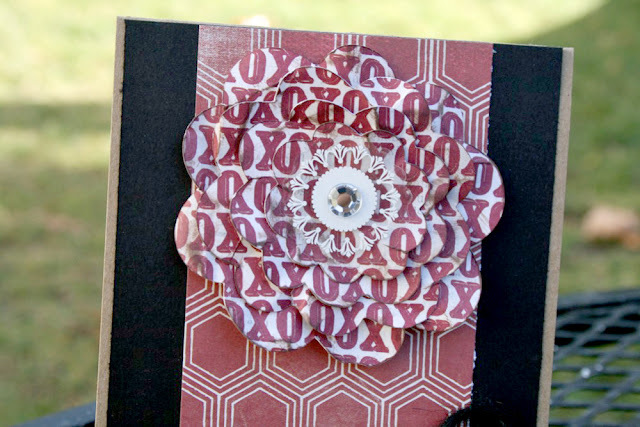 I used kraft cardstock for the base and some fun My Momenta papers for embellishing. 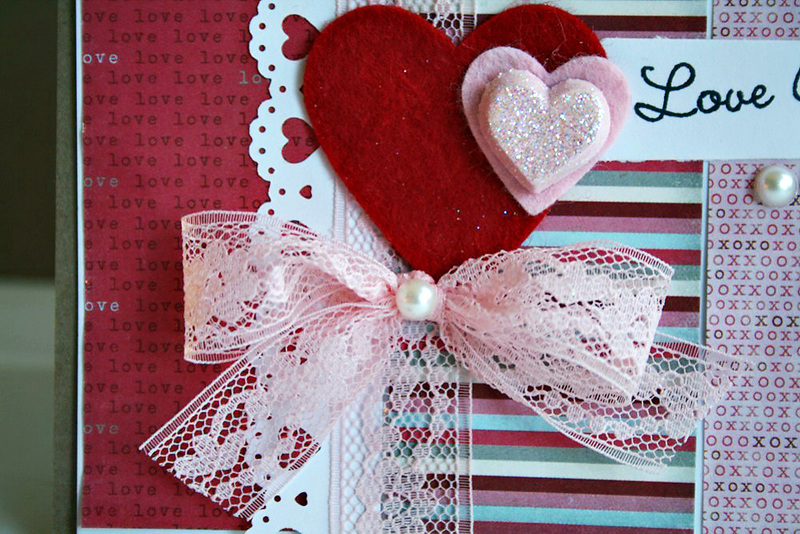 The papers are from the Free To Be Me 12x12 Super Paper pad and are perfect for Valentine's day. I also added some Flutter epoxy stickers to the front tab. The front tab I adhered with 3-D foam squares so I could tuck the front flap under it. When the box opens all the way, you can see the chocolates! I hope you try these little boxes. They are quick and fun. You might even be ambitious enough to make them for your child's classroom this Valentine's day! I have had the pleasure of making quite a few good friends through this crafting hobby of mine. Way back in 2008 (I think?) I met these two women on a scrapbooking message board...Beth and Joni. I had the pleasure of meeting Beth and her whole family in 2009 and 2010 when they were in Southern California for spring break. And I almost had the pleasure of meeting Joni, who is a fellow runner, at a half marathon race in Southern California but I was stuck in the bathroom line (nice, huh?!). I met Diane through Beth, and she is quite the amazing paper crafter as well. It's really so much fun meeting these talented and creative women from all over the country! Beth suggested we start a card making swap/exchange. I'm not sure we have an official name for it yet. But each month, one of us sends the other 3 a kit to make a card. You can send any supplies and the recipients have to use at least 4 things from the kit. This month Beth sent us some fabulous Valentine's Day themed goodies in our card kit. Everything was so great that this card literally took me about 10 minutes to create. Isn't it all pretty!!! She sent some My Mind's Eye papers, felt hearts, punched heart borders, beautiful pink lace, pearls, and some super fun clay hearts her daughter made!! Aren't the clay hearts so sparkly and pretty? 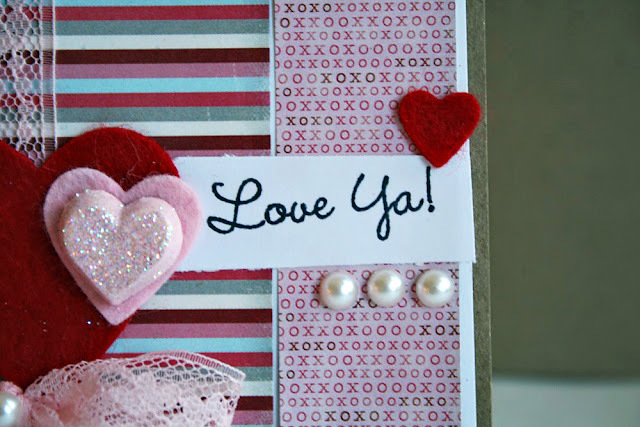 She also stamped a bunch of sentiments that would work with the theme, I chose this simple Love Ya sentiment. Happy Friday!!! Over the new year's weekend, Citrus Tree Studio had a really fun crop. And I actually got some layouts made. 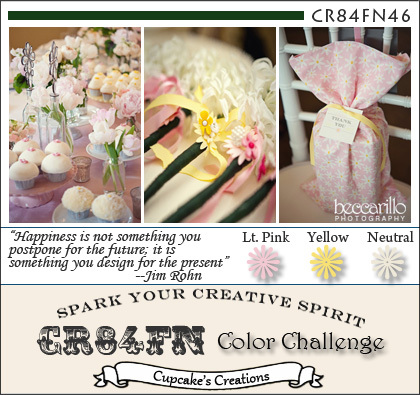 One of the challenges was to create a layout using confetti as your inspiration. So I pulled out this great photo of all the girls I play bunco with. We usually have a theme for our bunco nights and this night was white trash. One of the girls had full arm sleeve tattoos (fake, of course) and was wearing a hairnet and smoking a fake cigarette. And many of the girls were on a softball team together called Jugs and Thugs, and they wore their shirts. There were also trucker hats, bump-its, and red solo cups. SUCH a fun night!!! I used some Crate Paper paper that I had forgotten about and I created lots of confetti up in the corner with circles, brads, buttons, gems, and stickers. I also added this small banner and I love these big puffy thickers! What do you have planned for this weekend? Any confetti fun?? My son's basketball game got cancelled so now we have a wide open Saturday. I hope you all have a fabulous weekend and thanks for stopping by today! I have some cards to share today. All were made with the Citrus Tree Studio January Kit, which I love. Have I mentioned that yet, ha ha!! The kit came with some fun Technique Tuesday stamps which are perfect for Valentine's Day or pretty much any other occasion. I cut the flower shape on my Cricut, then crumpled up the paper in my hands. I then straightened out the paper, inked the edges and layered the flowers using 3-D tape. 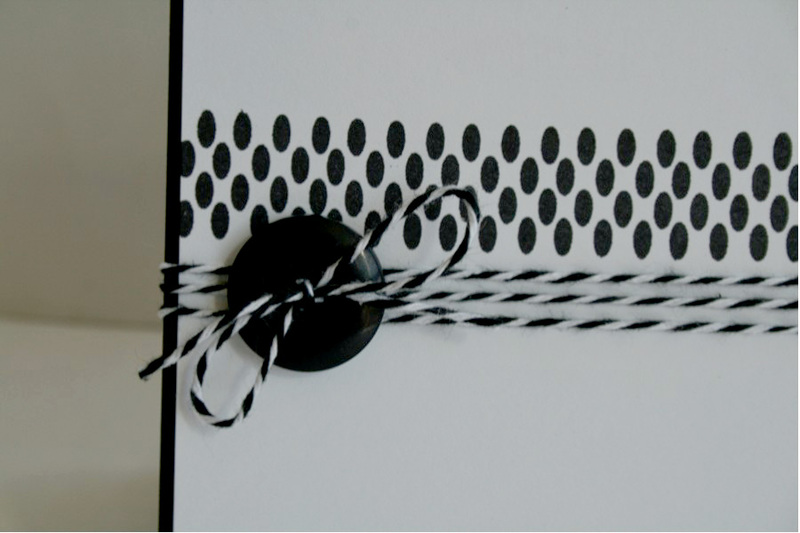 I love white ink on black cardstock! 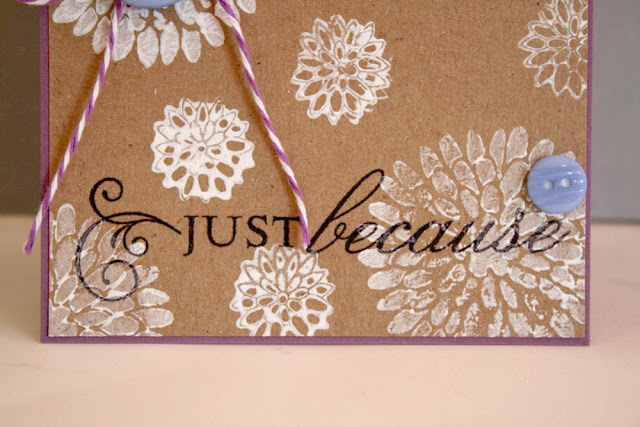 Here is one of the fun sentiment stamps. One more card, this one I punched squares with my old school Creative Memories square punch and used my butterfly punch. Pulling out all my punches made me want to run (or more realistically, crutch) to Michael's for a new punch. There are so many new fun border punches! Some small rolled flowers and another fun sentiment! And yes, it really is that nice in my backyard right now. The weather here has been amazing. Before my kids went back to school, everyone has been wondering if this was summer break or winter break??? I am still on crutches right now. I'm trying to take things one day at at time and starting to walk on my foot more (in my walking boot). I'm hoping to ditch one crutch permanently...and then 2 permanently. It's not going as quickly as I'd like it to, but again...one day at at time. Happy Monday everyone! How was your weekend? Ours was pretty low key, my son had a basketball game, my daughter had a birthday party to attend and we watched a whole bunch of football. Sunday while my daughter was at her party, my husband and I took my son to a sports bar and grill to get dinner and watch the Bronco/Steeler game. The place was packed and SO rowdy!! I couldn't believe how loud it was inside, I guess it's been a while since I've been out. My son was covering his ears the whole time, it was kinda funny. And he learned some new interesting words (even through his covered ears)...which was kinda funny also. Ha ha! Okay, on to the layout. 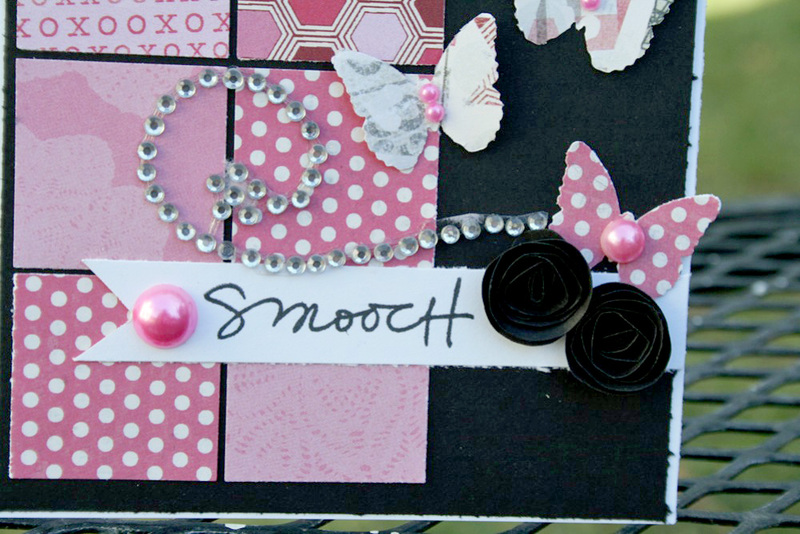 This is another one I created using the January Citrus Tree Studio kit. Lots of love for this kit! These photos are from a hot night in Palm Springs two summers ago. We were there to celebrate our friend's 40th birthday. 4 couples smashed into this van, heading out to paint the town. We had such a fun weekend! And when I mean hot, I mean hot. At 10:00 at night it was still 95 degrees out! I loved the little envelopes that came with this kit, as well as those heart stick pins and the fun doily clear stickers! And i've been into cutting flags into my patterned paper recently. I think its a fun look and another way to extend my banner/flag obsession. Valentine colors don't have to be just for Valentine's day photos! The colors of this kit can be used for almost anything. So head over to Citrus Tree Studio and grab a kit for yourself! 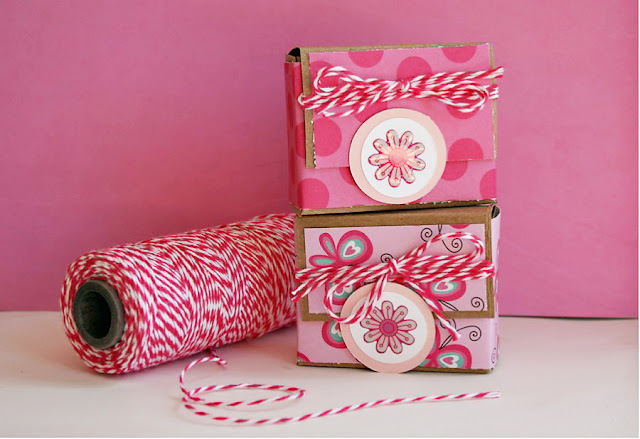 The January kit from Citrus Tree Studio is here!! And it's a beauty! 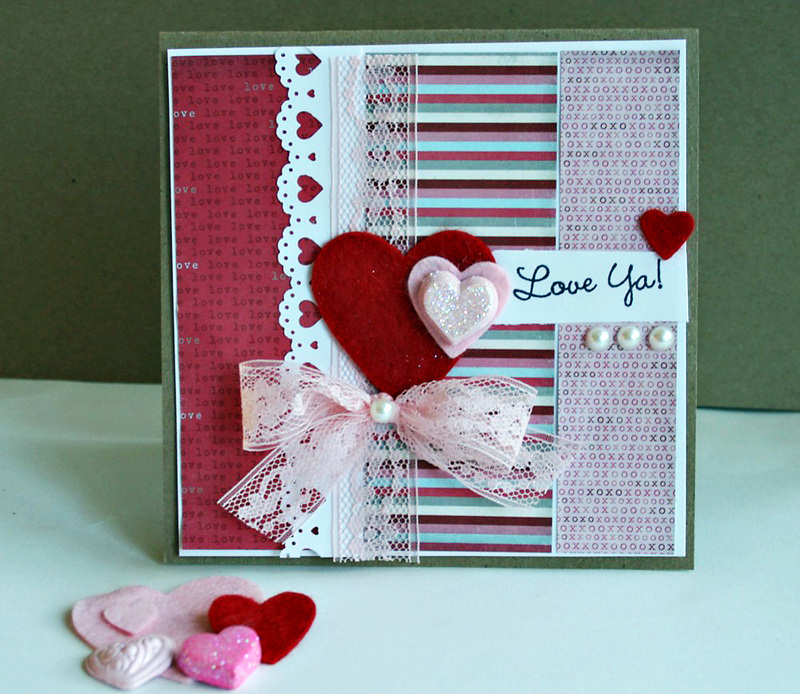 It's called Be Mine, Valentine and it's full of My Mind's Eye papers and tons of fun embellishments. As much as I love the holidays, it was so refreshing to create something non-holiday colors. Oh reds, pinks, and whites...how I love you! I really loved the colors of this kit. This layout is about 2 good friends of mine that I met when our girls were in kindergarten (Hi Mary and Bess!!!). I was actually inspired by the color of our cocktails, I thought it went so well with the colors in the kit. And I like the black twine in the kit, I decided to just throw it all over the layout! The banner is cut from patterned paper, I love that so many manufacturers have banners in their lines right now! The kit also includes some fun clear stickers with doilies, flourishes, and rhinestones. And this kit is packed with goodies. I made 3 layouts and 4 cards and still have stuff left over for more! That's it from me today. Happy Friday and I hope you all had a great week. Thanks for stopping by, today! !